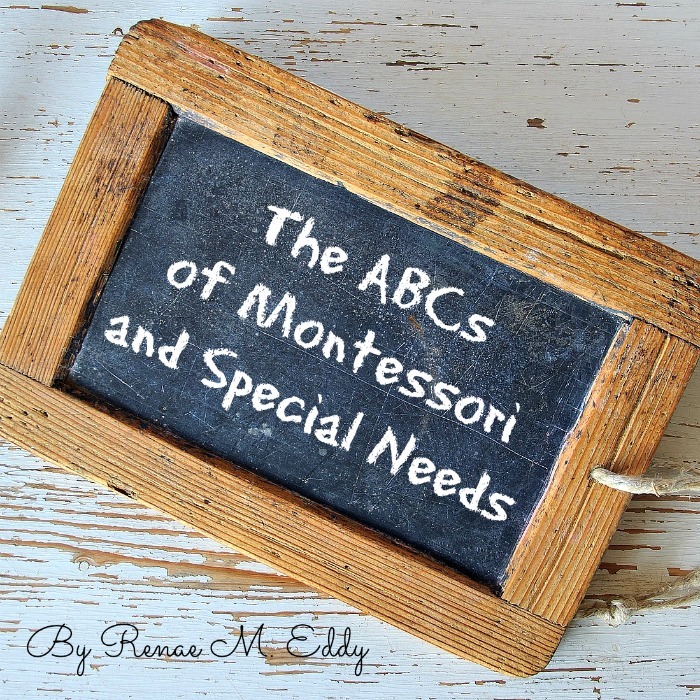 Maria Montessori was brilliant in the way she broke down the process of learning letters and sounds. 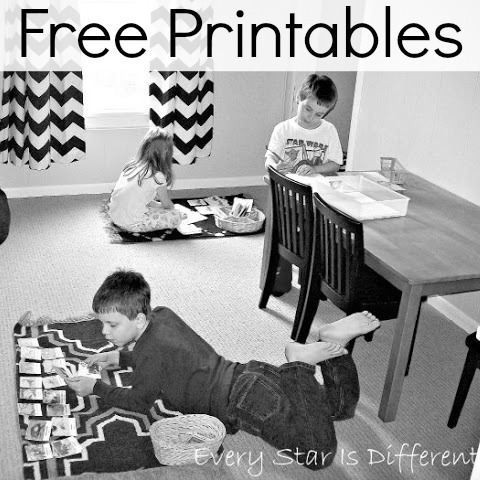 My oldest did not attend a Montessori preschool and missed out on the magic that occurs when using Montessori materials and lessons. But my three youngest have had the chance to experience it all. The younger three have such an advantage over the oldest. At first, I'll admit I was skeptical, but then I started observing my children. 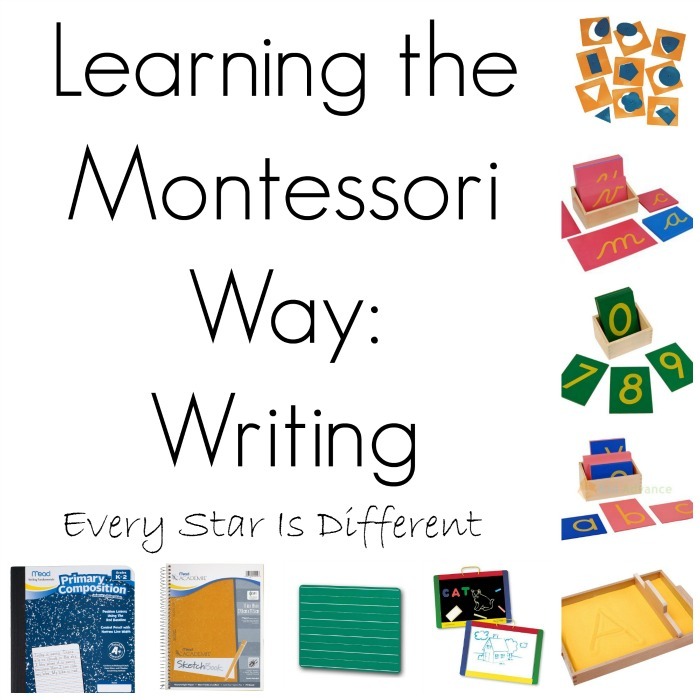 To see how learning the Montessori Way was completely transforming their learning habits and abilities for the better was a miracle I didn't think possible. The whining stopped. There were no meltdowns. My children were joyous as they completed their work. Here's how it all works! Mind you this is a very basic overview. There is so much more to be learned. But, if you're starting from scratch this should surely be enough to get you headed in the right direction. Before language materials are introduced to a toddler or preschooler, phonetic awareness can be taught using simple games such as "I Spy!" The Learning Ark provides details and instructions about the game. 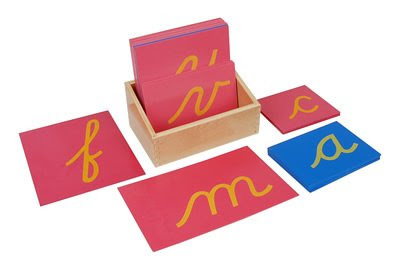 Children begin their language journey using the Montessori Lower Case Cursive Sandpaper Letters. Yes, you read that correctly. Most children in Montessori schools learn cursive first. Why? It is much easier for little hands. There is only one starting place. Children don't have to worry about starting and stopping with each line and letter. The letters are full of loops and curves. Reversing letters occurs less often when writing in cursive. At first I was a little hesitant about this approach, however I've learned quite quickly that all three of my older children find writing in cursive much easier. Their handwriting skills are significantly better . Bulldozer has struggled for YEARS trying to write his letters in print correctly and still makes mistakes often. When he writes in cursive, errors in formation are very rare. Dinomite doesn't struggle with letter reversal issues like he did when writing in print. It's a win-win situation for everyone. Now to be fair, not ALL Montessori schools teach cursive first. It depends on the training of the teacher and how the children respond etc. So, if you'd prefer to teach your child print first, the same materials used to teach cursive are available in print. 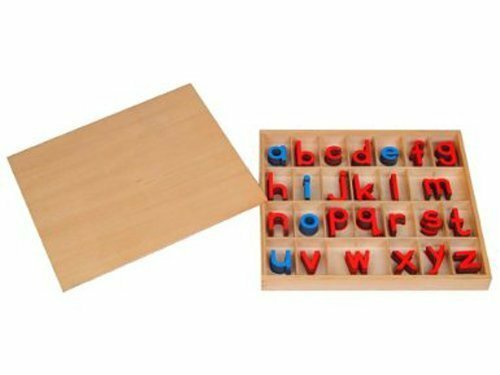 This includes the Montessori Lower Case Sandpaper Letters. No matter which alphabet you choose, print or cursive, you will introduce lowercase letters first. When introducing letters, you do not introduce them by name, but by sound. I'll repeat myself, just to make sure the concept sinks in. In Montessori schools, letters are introduced by sound, not letter name. As with all Montessori lessons, there are 3 periods. The same is true when working with the sandpaper letters. You can see an example of a three period lesson at Living Montessori Now. 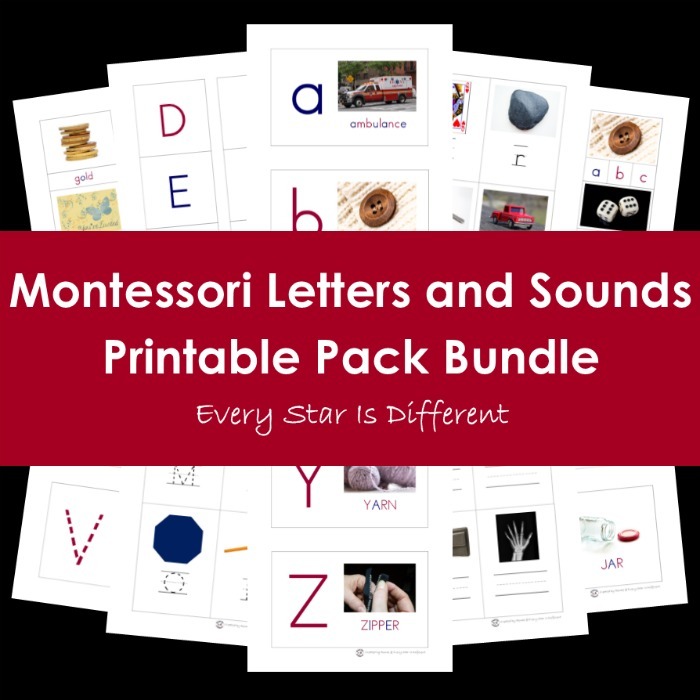 If you're unsure about the pronunciation of each sound, Living Montessori Now provides a video with instruction. 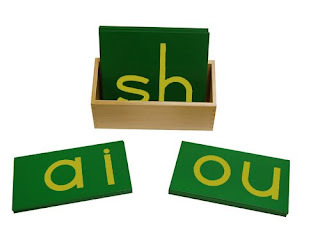 No more than a couple letter sounds are introduced at a time. There is no specified order of introduction, other than making sure that the letters don't look and/or sound alike. In our home, I prefer to introduce letters in the order of our Bob Books, Set 1: Beginning Readers . Living Montessori Now has a fabulous post with several different options of introducing letter sounds. Once sandpaper letters have been introduced, the child can use them as part of more phonetic activities, including more "I Spy!" games like this one from The Kavanaugh Report. If you are looking for mini figures to use in your activities, the Montessori Language Manipulatives from Montessori by Mom are fabulous! 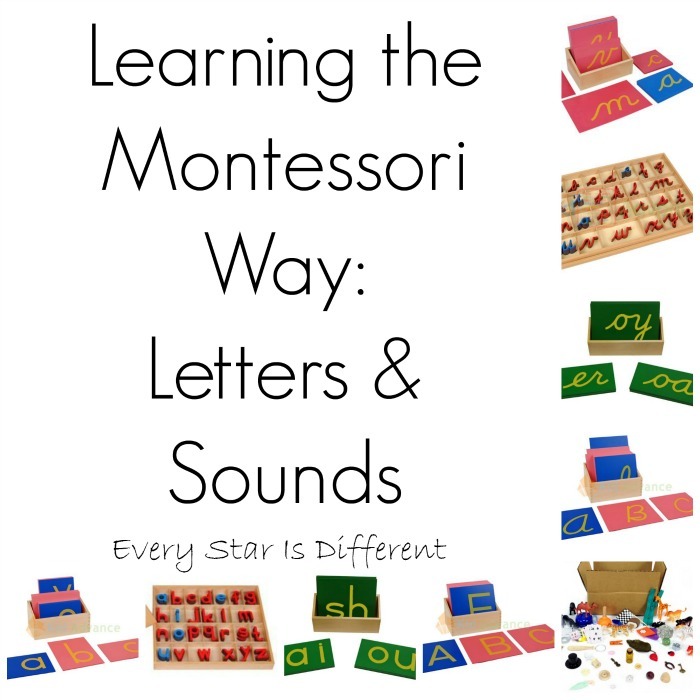 For those children who may need more work with letter sounds, you can find inspiration from a guest post at Trillium Montessori. 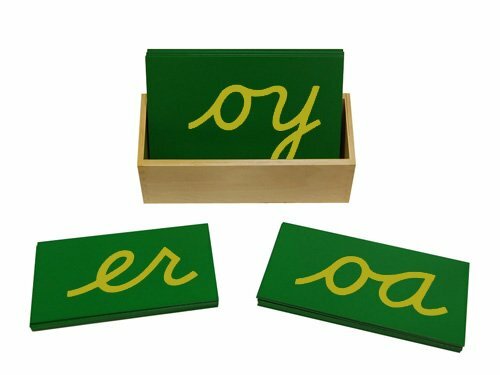 Once a child is learning and identifying letters by sound, you can also introduce phonograms using the Montessori Cursive Sandpaper Double Letters. Some teachers prefer to wait, but there is no need if you feel the child is ready. Remember, you always want to follow the child. Just like with single letters, only sounds are introduced. For a better understanding of how to introduce phonograms, I highly recommend watching the video in a post from Living Montessori Now. 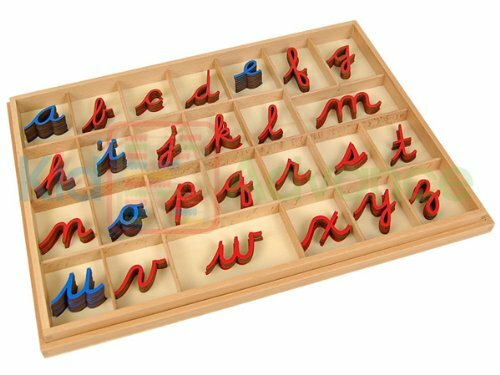 For those who to prefer to introduce print first, Montessori Lower Case Double Sandpaper Letters are available. The Montessori Cursive Moveable Alphabet is the next Montessori material introduced when learning letters and sounds. For instructions on how to present the moveable alphabet, visit the Montessori Primary Guide. For those who prefer to teach print first, a Montessori Small Movable Alphabet is available. 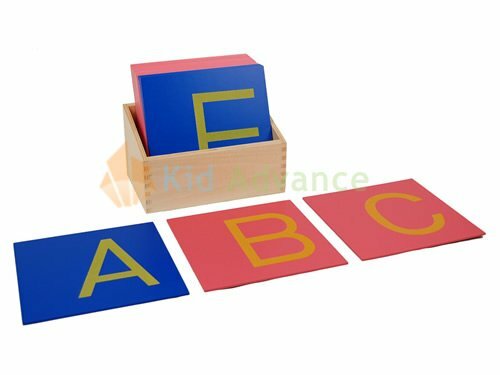 Once there is a basic understanding of how to use the moveable alphabet, there are multiple activities that can be created to go along with the material. 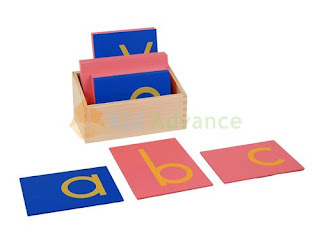 Maria Montessori created only three beginner language materials outside of grammar materials: the sandpaper letters, moveable alphabet and the metal insets which will be discussed in a later post. 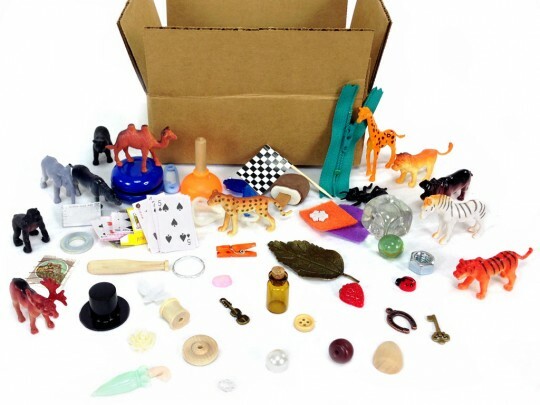 All other materials now used in some Montessori curriculum were created by others to supplement the original lessons and activities. 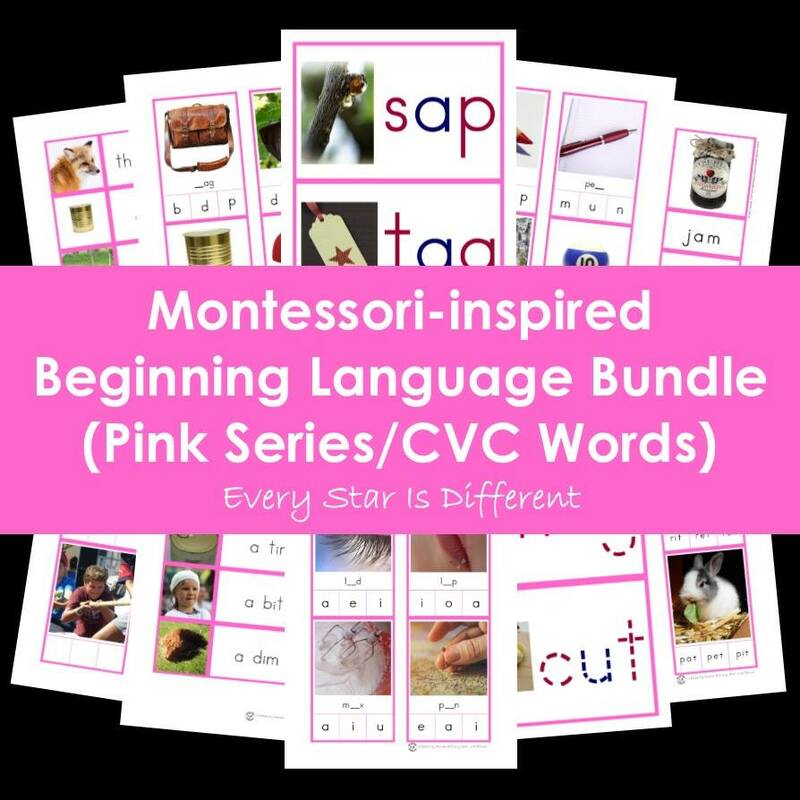 If you're looking for more resources, the bundles below have been such an incredible addition to our classroom. Teaching sounds first is a good example of how insightful Montessori was about the way that children learn. Experience taught her that the identification of letter names, capital letters, and their corresponding sounds come naturally to children, after they are introduced to the sounds first. If you have observed that a child is not able to identify letters by name in kindergarten, you may need to plan time to teach them. The same goes for uppercase letters. Once you have finished teaching cursive or print, you will teach the other form, if the child hasn't already picked it up on their own. 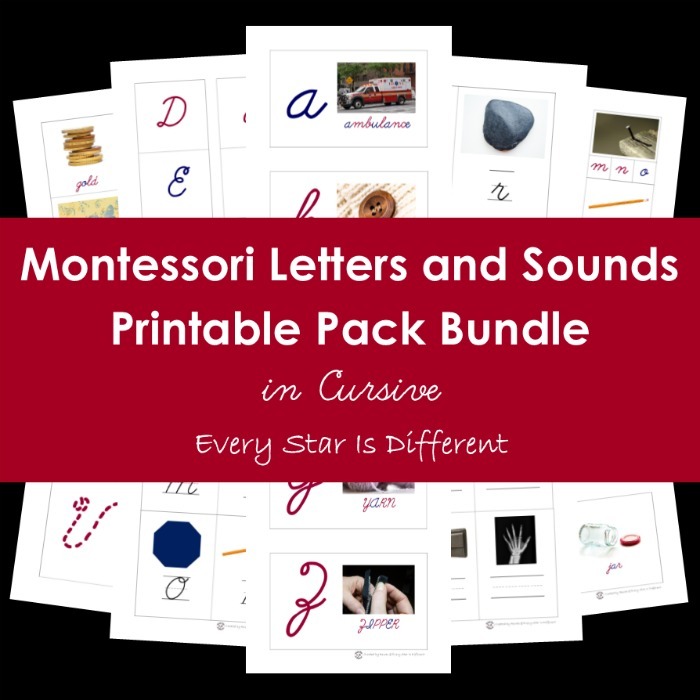 Montessori Cursive Capital Case Sandpaper Letters are available if needed to aid in this process. 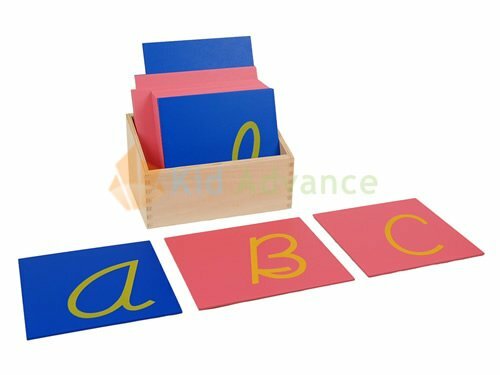 Montessori Capital Case Sandpaper Letters Print are also available. We love our sandpaper letters! The minute I think we can keep it away, is usually the time when we discover we still need to revisit the work. A wonderful breakdown and summary of the essentials. Thank you for sharing! Thank you for the post and it is very useful. Playschool is very important for a kid. Parents search for the best place to learn. The best place to enroll tour kid name in such a place like Montessori Schools in Velachery for the bright future.